are at the heart of our ThinkFirst programs. These individuals share how a traumatic brain or spinal cord injury changed their lives in an instant. Their upbeat yet poignant presentations offer audiences the opportunity to see and hear first-hand, live accounts of the consequences of poor choices (theirs or someone else’s)… like not wearing seat belts, choosing to drink and drive or playing with firearms. Reno High School graduate Drew Simpson was the star pitcher on his college baseball team, a freshman with a bright career ahead of him. During a night of partying with his friends, Drew drank too much and fell down three stairs, sustaining a massive traumatic brain injury. That misstep would leave him in a coma for over two weeks, requiring four surgeries and nearly a year of recovery time. Drew has chosen to take this devastating experience and share it with teenagers in hopes of stopping them from making choices that could negatively alter the rest of their lives. Tayler Dahlberg was 23 years old and was well on his way to accomplishing his dream of becoming a professional dirt bike racer, when tragedy struck. In the middle of a desert race, Ricky Dahlberg came across his older brother lying unconscious, face down in the dirt 30 feet away from his bike. The unwitnessed crash would leave Tayler with a severe traumatic brain injury, in a coma and on life support for 25 days. 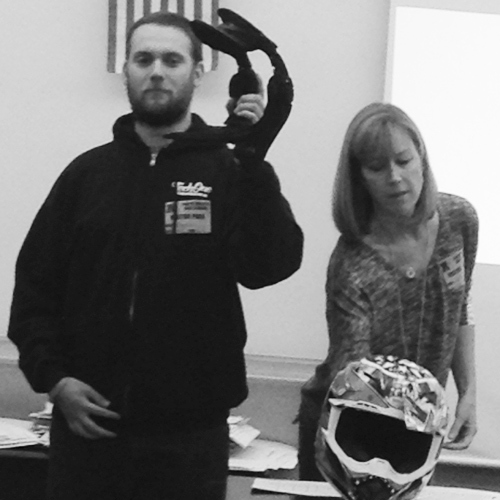 After more than a year of therapy, Tayler now shares his experiences with local students to educate them on the severity of traumatic brain injuries and how wearing protective gear saved his life. Spanish Springs High School graduate Blaze Brucato had his future clearly mapped out. He was serving in the Air National Guard while attending college at UNR with the goal of following in his father’s footsteps and becoming a pilot. 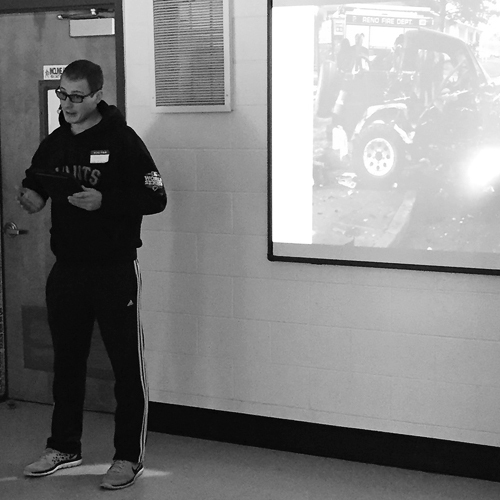 While running errands one December day, the car he was in was struck by a drunk driver. The result was a severe traumatic brain injury that would leave him hospitalized for nearly a year. 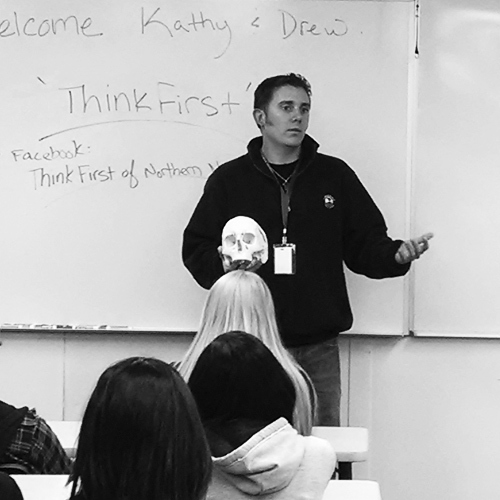 While rehab therapy is still an ongoing reality, Blaze has joined up with ThinkFirst to educate teenagers about how the consequences of their decisions/actions could not only affect themselves, but also devastate the life of another. The Bray family was heading home from an out-of-state visit with relatives when the unthinkable happened. In an effort to avoid hitting a deer that ran out in the deserted stretch of highway, Caitlyn’s dad overcorrected the steering wheel and sent their truck rolling multiple times in to a ditch. While Caitlyn’s mom and brother were uninjured and her dad sustained multiple orthopedic injuries, 14 year old Caitlyn suffered the brunt of the accident and sustained a traumatic brain injury. She was airlifted to Redding, CA where she would remain in a coma for 5 days. She missed the majority of her freshman year of high school due to the severe pain and memory loss that resulted from her TBI. 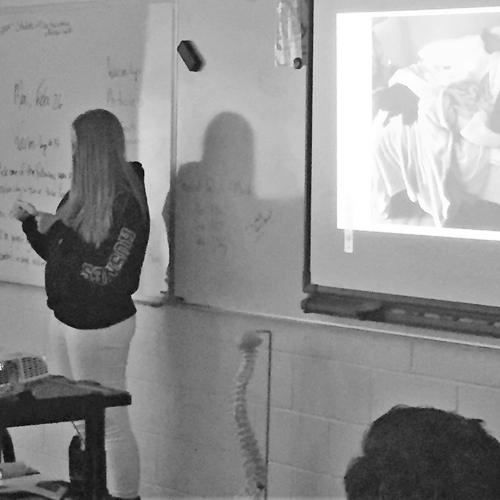 After hearing a ThinkFirst presentation at her school during her sophomore year, she approached the speakers and asked of she could share her story with fellow students. She is looking forward to starting college and having a little more time to spend with ThinkFirst. Each year an estimated 500,000 persons sustain permanent brain and spinal cord injuries in the United States. Correct use of an approved helmet is the best way to protect your head and brain from sports related injuries. Approximately half of patients with a severe head injury will need surgery to remove or repair brain bleeding or bruising.